Wedge Worldwide: Organic Tea Anyone? I’m not a tea aficionado, by any means, but I do go through tea jags, and when I do, I drink tea from my dragonfly tea mug and my dragonfly tea mug alone. Why? 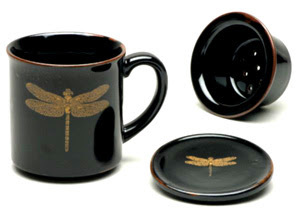 Because I love my dragonfly tea mug with a deep and irrational passion. I love the color. The weight of it. The little dragonfly on the side. And just so you don’t think I’m being flighty, the ceramic basket is perfect for drinking bulk teas and is much easier to deal with than a tea ball or a tea spoon, the lid (with dragonfly on it!) keeps the water hot during the duration of my tea’s steeping, and I can place the basket holding the wet tea on that upturned dragonfly lid when I’m ready to drink. Yes, as a matter of fact, I really have thought about this. * Organic White Peony Tea - White tea is perfect for that mellow lift at the end of the day, when the kids are still whipping along at light speed and I’m dragging behind in the groggy slow motion of adulthood. For me, anything stronger than white tea, and my brain is scurrying around all night like a hamster on amphetamines, so this one is perfect. Plus, I really love the clean, rosy aftertaste of this blend (I’m also a fan of the organic silver needle). * Organic Jasmine Pearl Green Tea - I break out this very special tea when special guests and good friends come over (but no one drinks from the dragonfly tea mug but me!). Jasmine tea puts a nice bounce in everyone’s step after a big feast, and the pearls are just plain pretty. 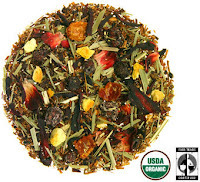 * Organic Jamaican Red Bush Rooibos - I’m not a fan of herbal tea. I don’t dislike it, but, as a caffeine-freak, it’s just not my first choice. Seriously, though, just look at this blend pictured to the left. It’s a pleasure to have this tea in the house. Earthy, tobacco-like rooibos offset by fruitier, giddier flavors like hibiscus and tangerine. Very nice.